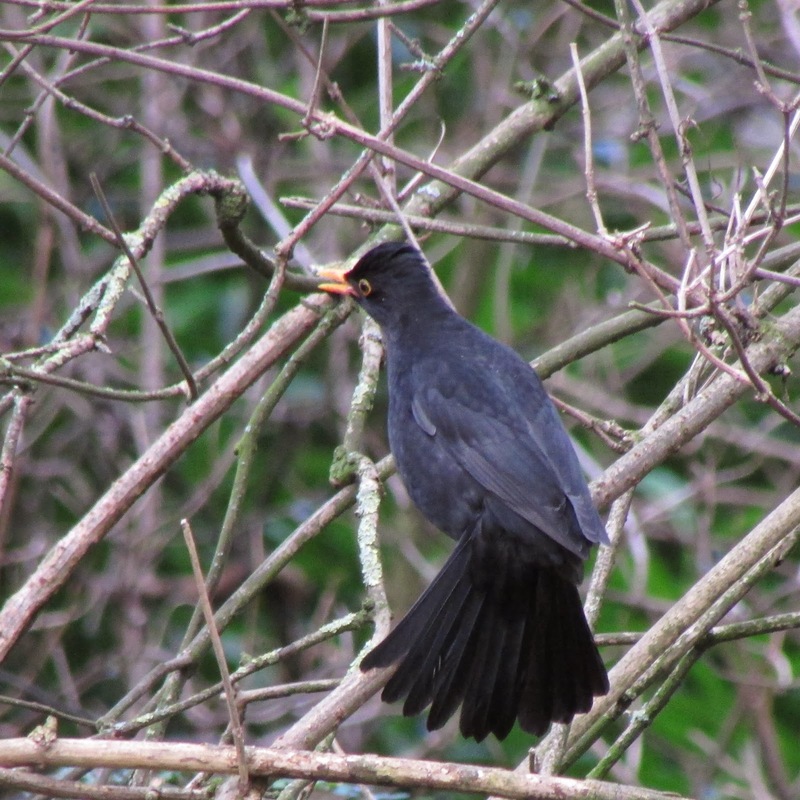 The Blackbird must be one of the birds I am most familiar with. Yet, I have only watched it courting once previously, and have never witnessed a copulation. Today I watched a male apparently subsinging inside a bush, but, upon approach, I realised it was an adult male adopting a strange, stretched-neck posture. 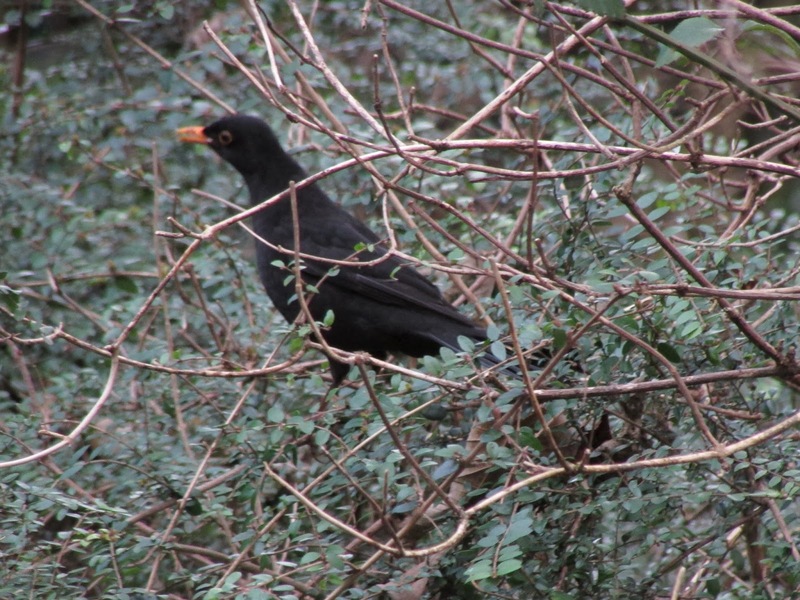 I watched the bird and realised that there was a female low inside the bush. I couldn't include her in the photos, but I managed to get a few of the male. The one above is my favourite, there are a few more below. 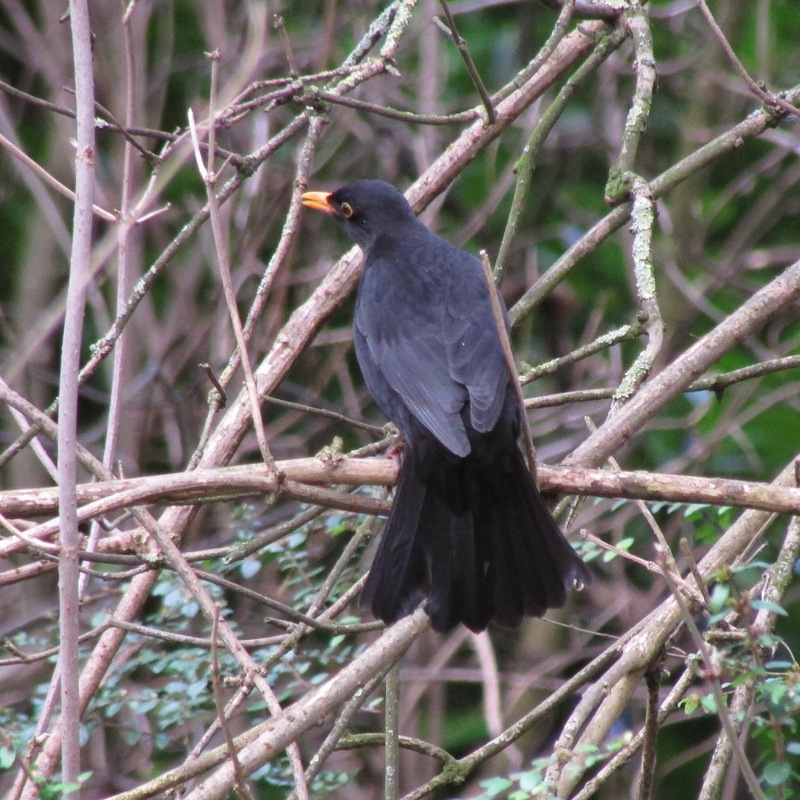 The fully developed courtship behaviour of the male is the blackbird's most striking display. The head, with the crown feathers partially erected and the beak open, is stretched forward; the neck-feathers are compressed, and the body feathers fluffed out, especially the feathers of the rump, which form a conspicuous hump; and the tail is fanned and depressed. The displying bird has a curiously wild, staring appearence.[...] The whole time, with his beak held open, he usually utters a low 'strangled' song, made up of chattering alarm notes, rough warbles and subdued snatches of what sounds like true song. If the display is performed in a tree, the male remains stationary or at most occasionally shifts to another perch near by, while the bowing part of the display is more prominent, developing into a rhythmic up and down movement of the whole head and neck. This display takes its full form during pair formation, unpaired males - young males or widowers - court females most often in February-March. Paired females attack displaying males, unpaired females appeared indifferent, although they might later mate with the male. A brief form of the display occurs just after females solicit copulation in the days prior egg laying. According to David Snow, copulation is always interfered with by other males, who jump at the copulating male, often knocking him off the female. Snow, D.W. 1958. A study of blackbirds. George Allen and Unwin Ltd.
What an interesting article, Africa. 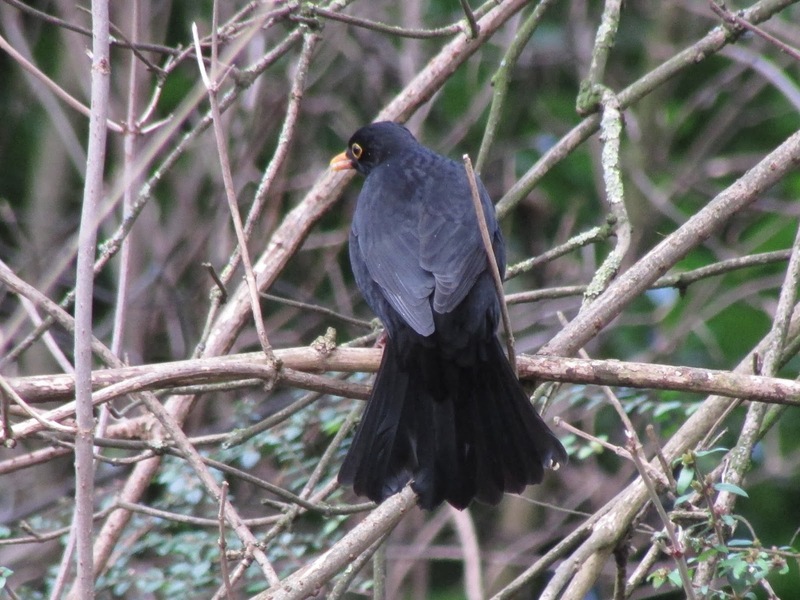 I don't think I have ever seen such behaviour in a Blackbird. Your first image is remarkable. Thank you, I felt quite lucky to witness this rare bahaviour. Saw a splendid display over a five minute period from my window this morning. The male was stalking around with it's beak open wide in such a strange posture I at first thought it must be injured. It ended with the female jumping on the male and seeing it off, must have had a head ache. This is the first time I have seen it in forty years of bird watching. It prompted me to google your article. I have witnessed two displays from a male on consecutive days at dusk. The male sits in fairly open bushes and performs a range of quieter singing (similar to that common in Robins when they are around you in the garden) and performing an alternating dance of neck bobs and beak wiping on the branch. I haven't been able to spot any females in the area at the time, but he was quite determined, continuing through moderate rain.